FTD® Partners with Best-Selling Book, The 5 Love Languages®, with an Exclusive Valentine's Day Bouquet Celebrating Its 25th Anniversary | FTD Companies, Inc.
DOWNERS GROVE, Ill., Feb. 6, 2017 /PRNewswire/ -- Premier floral gifting company FTD Companies, Inc. (NASDAQ:FTD) announces a partnership with Northfield Publishing and author of the bestselling book, The 5 Love Languages®, which celebrates its 25th anniversary this year. For over two decades, the book has been strengthening millions of relationships one language at a time. As the official floral partner, FTD has designed an exclusive bouquet, picked fresh from the farm to bring the love and beauty of Valentine's Day to a loved-one's door. The relationship-transforming book, written by Dr. Gary Chapman, has sold over 11 million copies worldwide and has been on The New York Times best-sellers list for 495 weeks running. The book describes five love languages: words of affirmation, quality time, receiving gifts, acts of service, and physical touch. Couples can discover their own love language and that of their partner by visiting www.FTD.com/FiveLove and taking a quick quiz, which will give them their results instantly. For those who find they communicate best via acts of service or receiving gifts, The 5 Love Languages® Bouquet is the perfect way to say "I love you" this Valentine's Day. Featuring an impressive array of blushing pink and red blooms that are picked to create a rush of romance, the bouquet includes pink Asiatic Lilies, red roses, pink and red Peruvian Lilies, fuchsia carnations, pink mini carnations, lush greens and a classic clear glass vase. "For over 100 years, FTD has been creating artistic and innovative floral arrangements that let the receiver know how loved they are, especially on Valentine's Day," said FTD.com Senior Vice President and General Manager Lincoln Roman. "Through our partnership with The 5 Love Languages® book, two long-time relationship icons are coming together in the name of love and romance this holiday. Our 5 Love Languages® bouquet is sure to speak to your loved one, no matter what language they use to communicate." "My wife and I have been married for 55 years, and we have flowers on our table every day of the year," said author Dr. Chapman. "I buy flowers from my local FTD florist and if I don't give them to her, she goes out and buys them. Most wives love flowers for Valentine's Day, and we're delighted to partner with FTD to celebrate the book's 25th anniversary with this special bouquet." 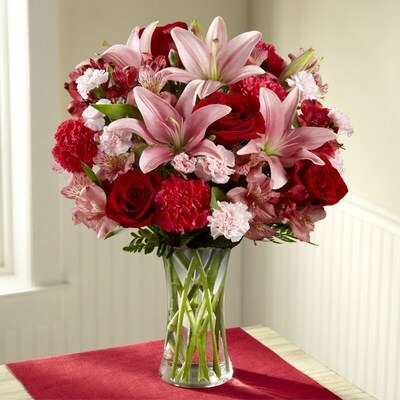 For more information about The 5 Love Languages® Bouquet, visit www.FTD.com/FiveLove.